Discussion in 'Cabinets & Speakers' started by Mark gordon, Feb 8, 2019.
it was in the years before 1980 obviously pretty well used by then . marshall jmp 50w 1968 on top . Can you show internal shots? Looks like it could be an early Marshal 1964-ish yes, but it is really a project cab in that condition, and is not going to be super valuable in my opinion. Apart from the badge, all the original parts have been stripped off. The sides have been chopped up for side handes - not good. 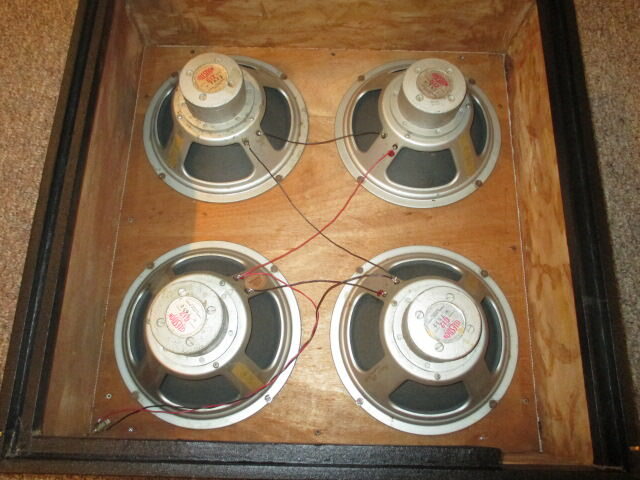 Speakers look like goodmans to me - not the original celestion alnicos. Great that it still exists at all of course, worth selling to someone who knows what they are doing with restoring them. in 1964 would it have had goodmans, pre rola or alnico . not been changed since then . I give up, someone else help him out. JerryD, steveb63 and GIBSON67 like this. From your posts you know a little......and don't know an awful lot more (remember the Rumsfeld quote!). You are lecturing to the guy above with some of the deepest knowledge of this era Marshall cabs, so carry on sharing the rest of your knowledge (eg how the first Celestion ceramics aka Greenback prerolas did not come in until at least 1965). Shame the Bygone Tones website is not up and running at the moment - you could read and learn some more . Looks like he ran away? Shame is it might have been quite interesting to see pics. Wonder if he has looked on the Bygonetones website now? A quick message from the uneducated, me, lol . Thank you for your input and knowledge , its very much valued, your free sharing of info is invaluable to a person like myself. Really appreciate your time, and opinions. Not all members are like the o.p. I guess I'm saying, don't let this attitude discourage you, lots of people need someone with your education. I was in a bad mood that day sorry. May have been a bit harsh. I would still like to see internal photos if 'mark gordon' is still around. Of the whole cab, rather than a close up of the labels. Not many of those cabs around, and each one is a piece of the jigsaw. I thought pleximaster, soundboy, tomsvintage might have chimed in to be honest. re value I sold a slightly later one (likely a block logo) in similar condition a few years ago at auction on ebay. It only made around £250 gbp empty. Maybe the market has picked up a bit since then, but at the time, very few people seemed interested. Perhaps too far gone, or people just didn't recognise it as a Marshall, who knows. You're right the coffin logo itself has some value, mine didn't have one. cut for handles or drilled on. Had the original holes and T nuts for the top handles. during the restoration on photobucket. It does seem that Marshall, and others, have dated these cabs (and heads) a year or so earlier than they were originally produced. One former employee from back then, has said as much. The first offset heads, and cabs, were more likely 1963, not 1962, and the second generation, like mine, were 1964, not 1963. Going by the speaker dates, this would be a late '64 cabinet. half (or less) than an all original one untouched in nice condition, whatever that is these days. I did take great care to use original type rexine covering, and used repro white pintripe from the guy who did Marshall's 50th anniversary pinstripe cabinets, as well as the newer Park stuff. Good luck finding an original one for sale, though. I have come to the conclusion, after talking with people and searching online, that there are about 10 or less known, including Australia, Germany, UK, etc. Just my research over the last years...although there is no way to know for certain. Tomsvintage has, I think, four of them (!!) in original condition. is as it came originally, minus the foam on the sides internally. The inside was covered in one inch foam, which was in tatters, and I removed, other than the back panel, which I left intact. I had no desire to put foam back on the sides, although it original had it...it sounds perfect as is, with just the back foam..
You can clearly see the remnants of the hide glue on the mahogany, on the top and one side. JimyTheAssassin, JerryD, CoyotesGator and 1 other person like this. The ceramic T1134s now make more sense, AFAIK they were first introduced at the end of '64, so it is possible that it is really late 64 or early 65 and those could be the original speakers. I don't think that black fret cloth would be original the white Vynair stuff was more typical. When were round braces used? If you can show pictures of the way the vinyl is cut and stuck inside that will reveal whether it is a rare factory cover or a recover (presume you have confirm that it was not painted). The corners were not usually a feature on early Marshalls and as the ones on there look different types it supports that suggestion. and I will replace the black front cloth maybe you can recommend where get original cloth from ? 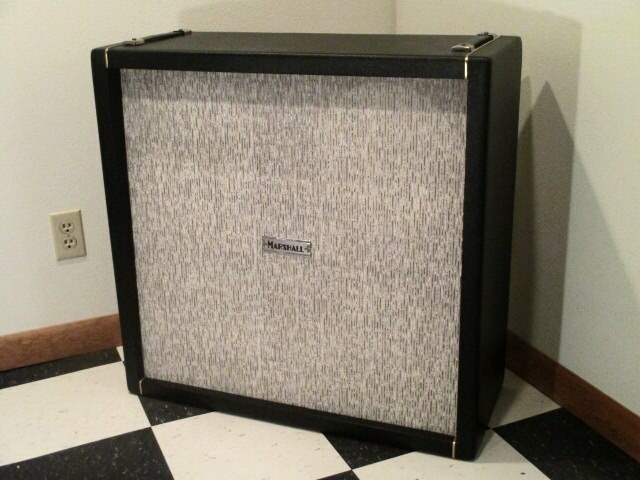 they look original on this cab, doesn't have any sign of holes on top or signs of top handles like soundboy57s cab which I have seen on fender and Marshall from that Era most Marshall cabs were black and white front . They didn't use side handles until mid 1967, and used top strap handles before that. So, perhaps somebody put a metal logo on a homemade cabinet, at this point. Would like to see the inside construction. The logo mount is different than mine, but the grain of the baffle looks like mahogany, and the T nuts are correct. Never seen a blue cab from any era of the 60s with that color, or a cab from that era without top handles. New pictures in the next few weeks. Me 120w and a old SG? Mine doesn't have a center brace, or corner braces. All the ones I have seen don't have any corner braces. that on Tomsvintage cabs, as well. He has four originals, circa 1964. They added a round center post at some point. Still wondering how the cab was moved about, without any top handles, before the side handles were installed?? Seems odd.